Philips Sonicare Healthy White Electric Toothbrush / Gee Whiskers! 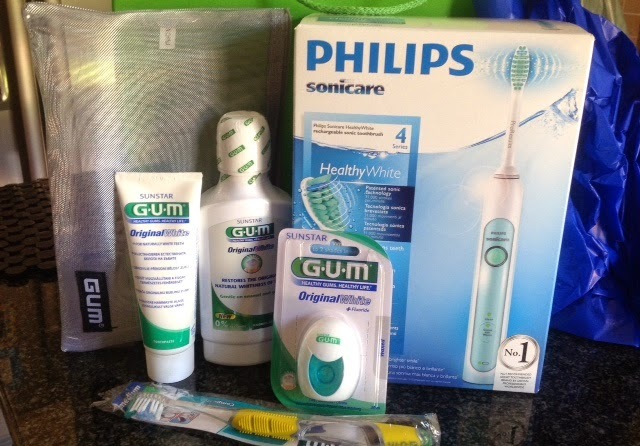 In December I received a great Sonicare Healthy White electric toothbrush from Philips. I have been meaning to write this review for a while now and finally got around to doing so. Previously I received the Philips Sonicare Air Floss a few months earlier so I was thrilled to receive this toothbrush to test out (Click here to read the review of the Sonicare Air Floss). This is by far the best electric toothbrush I have used to date. It has a dedicated whitening mode that removes everyday stains resulting in whiter teeth. Philips claims that your teeth will be up to 2 shades lighter within 2 weeks and I can honestly say it is not a lie. In conjunction to using the toothbrush twice a day, I used the GUM whitening tooth paste which further improved the noticeable whitening effects of my teeth. This electric toothbrush uses quite a different motion than what I am used to. Previous electric toothbrushes I used had small circular rotating heads. This electric toothbrush has a traditional toothbrush head that does 31000 brush strokes per minute. This quick motion takes a little bit of getting used to, initially it was very ticklish inside my mouth but after 3 days I was used to it. The bristles of the brush are soft so you never have bleeding gums after brushing. The shape of the head also forces water and toothpaste between your teeth for better cleaning. There are 2 cleaning modes - a 2 minute clean mode for effective cleaning of your teeth. Every 30 seconds there is a little vibration inside your mouth to let you know to switch over to the next zone in your mouth (there are 4 quadrants - top right, top left, bottom right and bottom left). Once you are done with the 4 zones you complete your brushing with 30 seconds on the whitening mode, where you focus on the visible teeth. The battery life of this toothbrush is really fantastic. You only need to charge it once every 20 odd days. Previous electric toothbrushes I have owned I usually had to charge every week which was tiresome for me. The Philips Sonicare Healthy White HX6711 Electric Toothbrush retails for around R1100 at Dischem. I have seen the price change quite a bit each time I go to Dischem but generally it is around this price range. I like this toothbrush so much that I went to get more heads for it. The replacement heads cost me R229 for a 4 pack - which is not bad at all because good manual toothbrushes cost well over R50 nowadays. The Gum dental care range is available at Dischem as well as certain P'nP stores. My teeth look and feel healthier. I continue to use the Philips Sonicare Air Floss with this Sonicare Healthy White electric toothbrush every day - I don't see myself switching to other products any time soon, that is for sure. Oh wow the untimate kit! Some are even fitted with receptors that observe the pressure you are applying to your gum area and tooth and will shut the Electric toothbrush off to prevent damage to the sensitive areas of your gum area and tooth. Growing up I never had a cavity. Not one. And (this is kinda disgusting) I never brushed my teeth, and I certainly never flossed. And even though that sounds disgusting, I never had bad breath.